It's too OP, it's too OP ! Pretty solid card if druid should be a thing. I always find low cost legendary cards generating a lot of combo potential. This card is perhaps bit worse version of Fandral Staghelm. You can get some nice extra value from all “choose one” effect spells like Power of the Wild, Wrath, Mark of Nature, Nourish, Starfall and Mark of the Loa. It’s worth mentioning you get both effect as an extra card to your hand along with casting the chosen one. 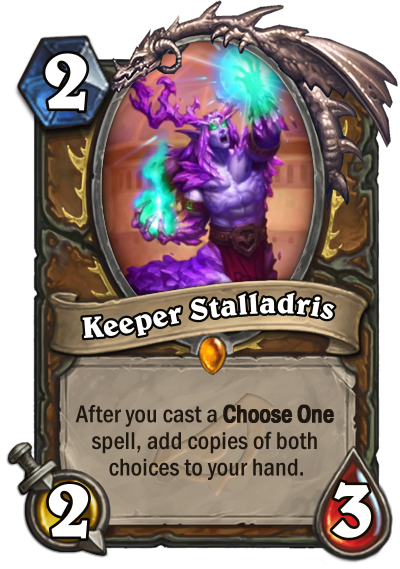 I definitely can see combos like Keeper Stalladris Power of the Wild Leader of the Pack Power of the Wild Leader of the Pack to gain +4/+4 in token druid. Biggest issue is small number of “choose one” spells in standard as for now, but there are some neat spells in wild that can benefit from this card. I hope this card will see some play as I like the design. Since the reveal video showcases that spells returned to your hand cost as much as original spell (not 0 mana shown while casting), combo potential is smaller. I could see some potential with this card in combo decks, but only to generate more cheap cycle. If druid gets more sustain options, then a control version would appear, but what would be the win-condition there? Regarding wild - well, imho Fandral is more powerful there (especially in jade druid). My storm bringer deck keeps getting worse. That aside, pretty good value card. Wrath is obviously insane. Well stated minion wth strong effect. Only problem I have there are not too many choose one spells atm which make this effective. Only ones I can think of are Wrath, Starfall and Power of the Wild. So you need a couple of such spells in your deck to warrant inclusion of such card in your deck. Else it won't be consistent enough. But I'm pretty sure we will get more Choose One spells this expansion. This + Loti = all 4 forms? Spells. I can see it maybe working with the AOE buff simply to generate extra copies. That aside, pretty good value card. Wrath is obviously insane. How does this work with minions? I am thinking tending tauren. It doesn't work with minions at all. Read the card text again. This works only on spells. Was just about to edit. You got there too fast. It works only with spells, read text people. This and Wrath is 4 mana 2/3 deal 3 or 1 and draw a card, add a shiv and fark bomb to your hand. Pretty good. So this card is decent on its own even if you only ever get 1 use out of it. It's like a mini Auctioneer that will probably get killed immediately the turn after you play it. This gives me hope that they will release a Twinspell with a Choose One effect. Then I think this card will skyrocket in value. In Wild, this has some crazy potential. And will be used as a value engine combined with Fandral. I mean, with Fandral, this card and Jade Idol means you get a crazy amount of value. I love these small minions with potentially very powerful effects. Nice card! What choose one spells do Druids still have ? Do they even have those anymore or did Blizzard nerf that as well ? Well, it is more value than fandrall (3 for one instead of 2 for 1), but won't hang around as long, and it does not generate tempo as well. In short: It brings back a cool effect in a completely new way. Design 5 stars. Balance, 5 stars. So bad...Choose One effects are usually overcosted on their own. It's the fact that you choose that makes them work. He essentially turns your Choose One spells into Twinspells, except better. Useful tool for Token decks (Power of the Wild) and Combo decks (Wrath) so far. THIS is more powerfull especially in jade druid, cause the spell in your hand is 0 cost, so geist does not counter jade druid anymore.